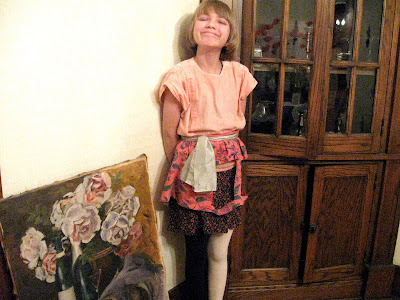 What I wore today, with this picture from Susie Bubble stuck in my mind. I am quite idiotic to have realized just today that the easiest way to DIY a cage dress is to cut squares out of something you already have, not, um, staple strips of fabric together, NOT THAT I EVER TRIED THAT OR ANYTHING...read: it did not work. Anyways, I'm still finishing doing it with this skirt and am about to start with a peach colored plainly hanging dress. top: mom's in the 80's. scarf: ? 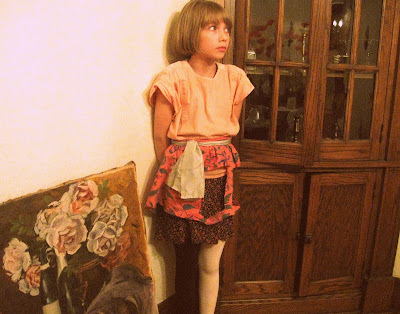 both skirts: childhood closet. tights: aa. I know I overwear them. Oh, the hair? Ah, the hair. I've been saying for so long I'm going to trim my bangs, so yesterday morning I just grabbed a pair of scissors and was stupid enough to cut a straight line across my forehead. I now have front bangs, but I quite like them. I just need to even them out and cut the rest of my hair, and I think I'll try for a sloppy bowl YSL-ish thang or something. Lesson of the day: do not trust me with scissors. my hair and my dad, who in this picture reminds me of that arthur episode where it shows his digestive system and he's a huge stomach. Also, I saw A Streetcar Named Desire last night. Me: That was way too deep and intense. I need to now watch something shallow and meaningless and with cheesy and/or terrible acting. F: Like The Emperor's New Groove. Me: Yeah, or we could see High School Musical 3. It would be kind of hard getting past all the 8 year old fangirls though...eh, I'll just stomp on them. F: Sure, except they're all taller than you. And who am I to argue about that? We ended up just staying at home and making fun of the Seventeen issue with Ashley Tisdale on it, anyways. Did you know she lives right next door to Vanessa Hudgens, and that the JoBroz, Milez, Hillzary Duffz, and Zacz live down the street? I laugh hysterically. Then today I had a fight with Drew over the symbolism of Streetcar and the chinese paper lantern. THE BARE LIGHTBULB IS BLANCHE, DREW. Coming home today and seeing a note on the counter, "BLANCHE CALLED" and a picture in The New Yorker of Marlin Brando as Stanley 50 years ago was kind of freakish. Try, A Streetcar That Stalks You? Oh, Tavi, you and your jokes and grandma haircut and obnoxious third person Dominique/Elmo way of speaking! You're too much, dahling.